Open Hosting space home page. 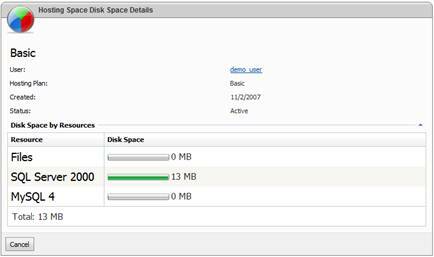 Control panel offers various reporting features such as quotas report, disk space and bandwidth reports. You could see key quotas and their usage right on the hosting space home page. 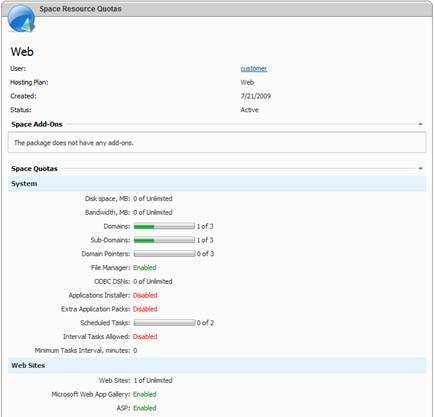 On this form you could see the date hosting space was created, its name, hosting add-ons assigned to the space and full quotas report. Quotas report shows what services are enabled in the hosting space as well as quotas for each service. Each quota shows the maximum number of allocated resources and how many were used. To export report in HTML format click Export Report button. Report shows disk space breakdown for all resource groups within the space. 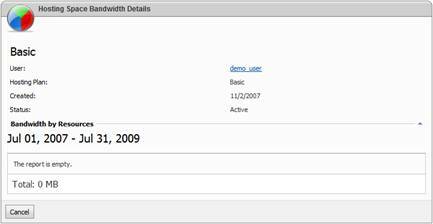 Use date filter or Previous month and Next month links to see bandwidth overview for desired period. Report shows bandwidth breakdown for all resource groups within the space for the time period selected on the previous screen.